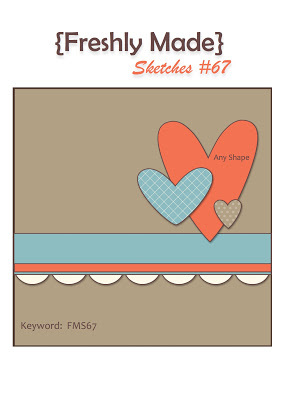 Hi and welcome back to another sketch challenge hosted by Create with Connie & Mary. My card is a lot bolder than I'm used to. I chose the color combo from the Color Coach and went with a Valentine's theme. The scalloped edge was created using the Large Scallop Edgelit on both edges then the Adorning Accents folder for the heart embossing. Thanks for looking. Head on over to Create with Connie & Mary and check out the rest of the DT cards. 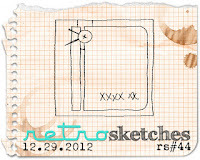 And while you're there, give the sketch a go. I went with a collage look for this card using multiple images in varying ink generations. I first inked up the Netting background then placed my cardstock on top and "walked" my fingers across the card so that not all the card was inked. Then I stamped various images from Nature Walk and French Foliage in Crumb Cake and Soft Suede ink. For all but the postmark images, I stamped off the Soft Suede ink to give a lighter impression. The banners were made using First Edition DSP and sponging the edges with Crumb Cake. I then curled the edges slightly. 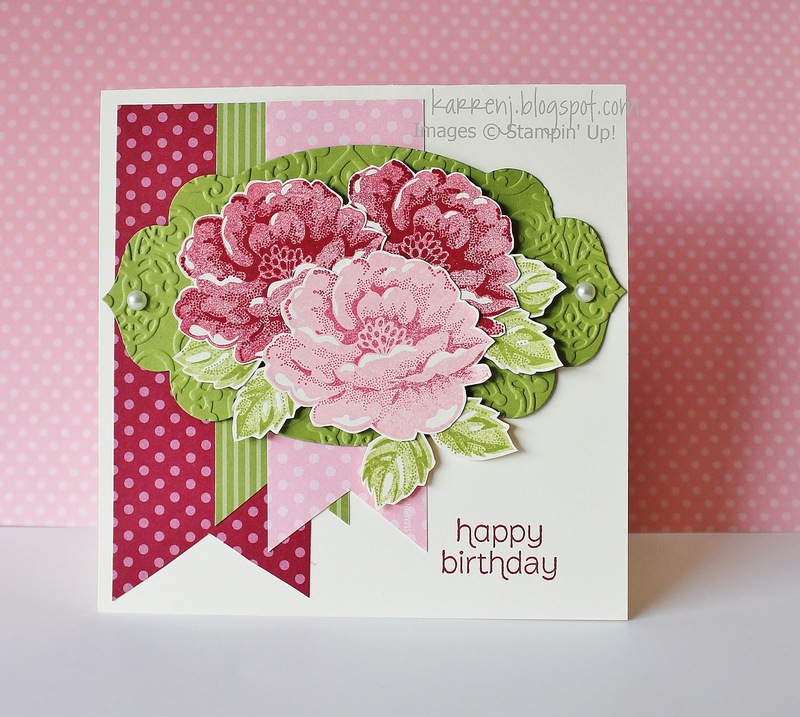 The die-cut foliage is from a PTI set called Larger Than Life with matching die. I would have liked to use the Secret Garden foliage from the upcoming mini, but I don't have that set so had to make do. All in all, I'm quite happy with this card. I didn't put a sentiment on it which makes it suitable for many different occasions. Thanks for looking. I'm glad I had time to play along with this challenge. Most challenges posted on Sunday or Monday (NZ time) I can't join in on because of work and other commitments, but having this week off work means lots of card-making, hopefully! Edited to Add: This card was chosen for an Honorable Mention at Dynamic Duos. Thanks, guys! I had a fun day today. My boys came home after a week at their grandparents and my mum, who brought them home, stayed to make some cards with me. This card was one I was part-way through when she arrived and I wasn't happy with it, so left it for a few hours and just finished it off now. 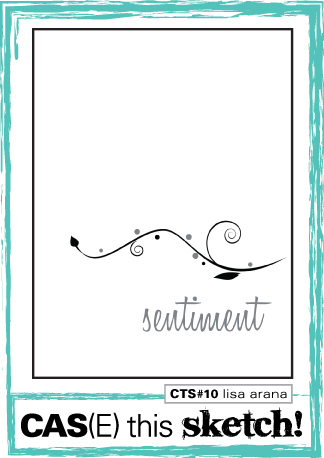 This card uses this week's sketch at Freshly Made Sketches. I had the idea to sponge a panel using Daffodil Delight; Calypso Coral and Old Olive but as I was sponging, I bent the cardstock and consequently got a line right across the middle. To "fix" my mistake I screwed up the whole panel then sponged over the top to make the marks look deliberate! I used the Stippled Blossoms set again for my main image and the Honeycomb EF to give some interest to the Vanilla background. I've got the next week off work so of course I have planned to do some card-making (along with getting the boys ready for back to school in a week). Anyway, I thought I'd try my hand at the following challenges: Color Throwdown; Seize the Birthday and Still AddInktive. I decided to use Bloomin' Marvelous, which is a SAB set (Still AddInktive challenge) with the sketch at Seize the Birthday and the colors from Color Throwdown and here's the somewhat average result. This is a notecard-sized card at 5" x 3.5". The oval is the wide oval punch which gives some idea of the size of this card. 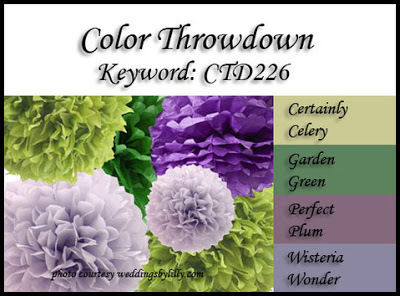 I stamped a few flowers in Wisteria Wonder and Perfect Plum, along with some leaves in Certainly Celery and Garden Green (stamped off). After I'd cut them out I arranged them around the oval. The DSP is Perfect Plum and Certainly Celery. A few pearls finish of the card. Hi all, we have another color challenge this week at Create with Connie & Mary. The two darker roses were stamped using Raspberry Ripple stamped off twice for the background and full strength for the highlights. The lighter rose was stamped using Pretty in Pink full strength for the background and Raspberry Ripple stamped off twice for the highlights. Thanks for looking. Head on over to Create with Connie & Mary to see what the rest of the challenge team has come up with. 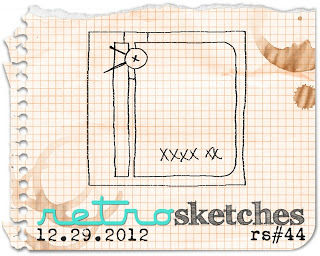 The sketch challenge this week at Freshly Made Sketches threw me for a bit. 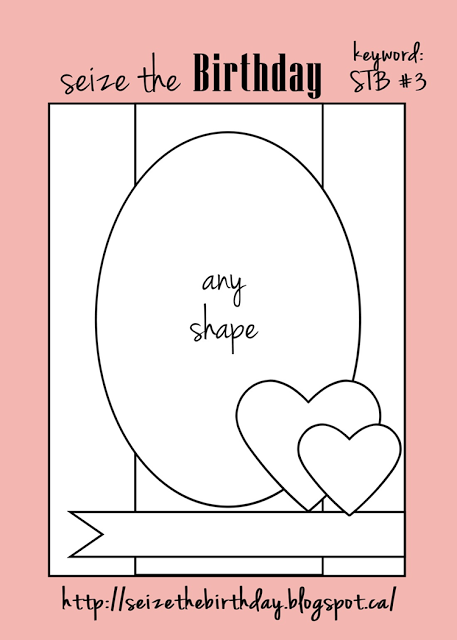 I normally don't make cards with angles other than right angles, so this bold sketch with a diagonal made me want to run for the hills LOL. However, I slept on it and came up with the idea to disguise the diagonal a bit which appealed to the right-angled part of my brain! I'm also entering this card into the challenge at SUO Challenges which is to use something new. This is the first time I've used my Honeycomb Embossing Folder. I didn't stick totally faithfully to the sketch but I did stick to the concept. I cut pieces of cardstock in varying lengths and then run them through my new honeycomb embossing folder. I then disguised the diagonal look with lots and lots of punched branches from the bird punch. Three rolled roses made using the 1 3/8" circle punch were placed in conjunction with the sketch. If I made this card again (and let's be honest, I most likely won't!) I would like to see a row of cascading roses rather than just three. 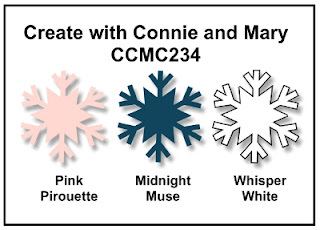 This week at Create with Connie & Mary we have a sketch challenge. I decided to go masculine with this card, using the new By the Tide set in the upcoming mini. 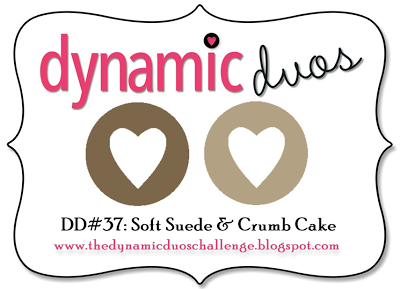 My card base is Crumb Cake, stamped with the Netting background and sponged in Crumb Cake and Soft Suede ink. The main image is clear embossed with Soft Suede ink then masked and overstamped with the text stamp from the By the Tide set. I then sponged around the edges using Crumb Cake and Soft Suede ink. 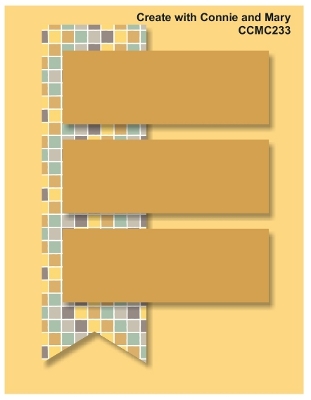 A neutrals button tied with a sliver of cardstock finishes off the card. Thanks for looking. 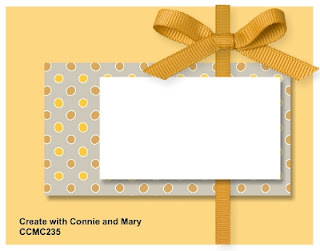 Head on over to Create with Connie & Mary to check out the rest of the challenge team's submissions. I made some time to make another card today - this time for the sketch at CAS(E) This Sketch. For this card, I went with a white on white look with the music notes die cut. I layered this onto Real Red for some contrast. This card was really simple and came together quickly. It's way too hot here in Christchurch to do much of anything, so it took me over a day to get one little card finished. I know our temps are nowhere near those in Australia at the moment or most places in the US in their summer, but for us, it's HOT! There is absolutely no breeze and it's so hot and dry. We traditionally have a very mild climate year round, which is why I like living here. Anyway, enough whining. Here's my card for this week's challenges at Freshly Made Sketches and The Friday Mashup. This is not a favorite card of mine. I do like the color combo of Island Indigo; Sahara Sand and Early Espresso though. For this card I cut a doily in Pink Pirouette and positioned it partly off the card base. I used the Adorning Accents die and EF for the side of the card base and filled the gap with a Pink Pirouette strip and a sliver of Midnight Muse. The sentiment banner is curved and lots and lots of pearls were added in an attempt to lift the paleness of the Pink Pirouette. Thanks for looking. 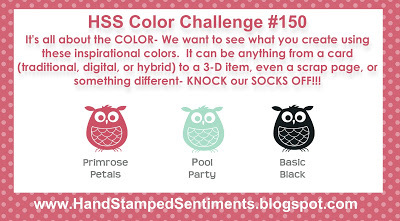 Check out the rest of the design team's samples and give these colors a go yourself. 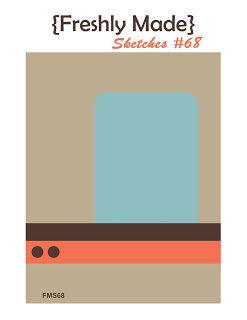 As I said yesterday, the sketch this week at Freshly Made Sketches is very versatile. I had this idea swirling round in my head all last night so when I got time today, I had to make it. Today I paired Basic Black and Basic Gray with Lucky Limeade. I made three Floral Fusion flowers and placed a faux brad in the center of each. The DSP is Basic Gray from the Neutrals stack. 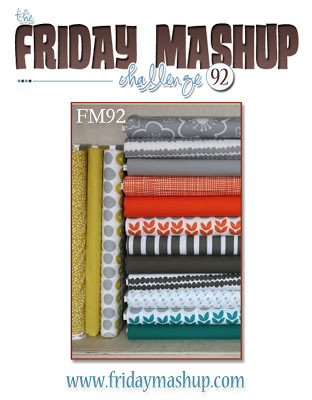 Both the sketch challenge at Freshly Made Sketches and the color challenge at Pals Paper Arts were too good to miss this week. The sketch is so versatile and it was hard narrowing down my options for the embellishments. This'll be fun to use over and over again. 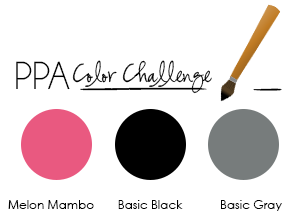 As for the colors, I never used to like Melon Mambo but it goes so well with black and gray I just had to use these colors for my card today. I think this card will go to my niece on her 12th birthday in a few months. For this card I used the retired large and small star punches - love these punches! For the large black stars, I first punched with the small punch then went over with the large punch to create a frame. The sentiment is black embossed and the scallops are paper pierced. Edited to Add: This card was chosen as a Perfect Princess card at Freshly Made Sketches. Thanks guys! 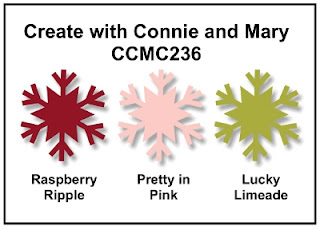 This week at Create with Connie & Mary, we have a sketch challenge. I struggled with how to use the three horizontal elements until I decided to flip the sketch on its side and use one image cut into three panels. I used the Countryside set and stamped the truck onto watercolor paper, then colored it using reinkers and blender pen. I sponged around the outside lightly with Crumb Cake ink before cutting into three equal panels. This was then layered onto Not Quite Navy cardstock. The First Edition layer has been distressed and over-stamped with some of the smaller images from the set. The Riding Hood Red banner has been run through the Woodgrain EF. 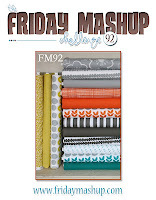 The color combo came from the Color Coach - love that thing! Thanks for looking. 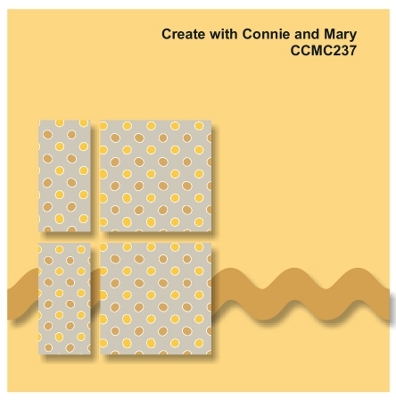 Head on over to Create with Connie & Mary to see what the rest of the challenge team have come up with. My flower has been spritzed with shimmer mist which makes it all sparkly IRL. My branches are black, which is a bit odd in nature, but hey we'll just pretend it's normal LOL. The flower is one I've seen around the internet a few times. Not sure who came up with the original idea but it uses the Fancy Flower Punch; the 5-Petal Punch and the Boho Blossoms Punch. Thanks for looking. It's back to work for me tomorrow, so I'll be back to only being able to stamp on the weekends - boo hoo. Well, I didn't think I'd be making a Christmas card quite so soon in the new year, but when I saw the sketch challenge at Still AddINKtive, the idea popped into my head to make an ornament Christmas card. While my card doesn't stick 100% to the sketch, the elements are there. 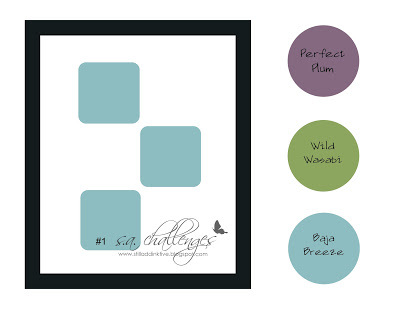 The buttons in Baja Breeze and Wild Wasabi have centers punched from the Ornament Keepsakes set. The sentiment is stamped in Perfect Plum and the card has a framed scored around the outside. This is just a little baby card, weighing in at 4" square LOL. Thanks for looking and good luck to the Still AddINKtive team on their new venture. The stamped image is from Penny Black and called "Tom & Tilly". As soon as I saw it, I knew it would be perfect for my parents. I colored it using Prismacolor pencils and Gamsol. Because the image was so big, I was a bit limited in my layout. Thanks for looking and congratulations Mum and Dad! I'm nearly at the end of my Christmas holiday and head back to work on Thursday for financial month end. Before then, though, I hope to do a bit more stamping. Here's a card I made for the current challenge at SUO Challenges, which is to use blues. This is a CAS one-layer card involving lots of sponging. I masked off a strip of the card and sponged four different blue inks from light to dark down the strip. Once that was done, I removed the masks and stamped the silhouette image from Just Believe in Stazon, along with the 'thank you' sentiment from Made for You. A couple of tiny pearls and some Midnight Muse ribbon finishes off the card. Before I go, I want to post a message here to Pat from North Carolina who sent me a lovely email yesterday. Pat - I tried to reply but your email provider rejected my email for some reason. I don't want you to think I ignored your email. Thanks so much for the lovely words. It really is a small world!